Ready, set, spring! If you're anything like me, waiting out winter's last days is much more tolerable when you can shop the new spring arrivals in anticipation of warmer weather ahead. 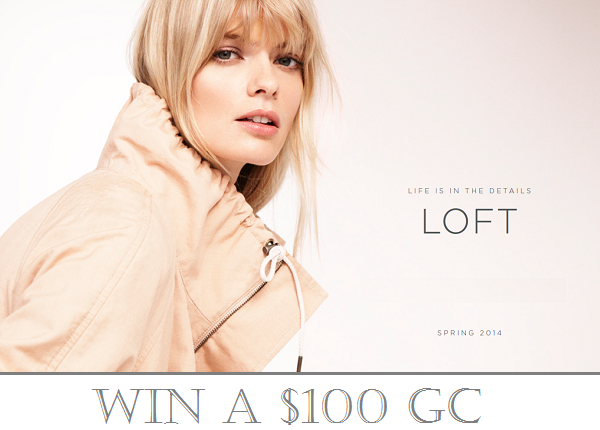 LOFT evidently feels the same because they're offering one lucky Solo Lisa reader a $100 GC. All the more reason to hop in your car and make the trip to Vancouver's first LOFT store in Park Royal! If you've never been to the Park Royal store, you're in for a treat; it's wall-to-wall feminine, classic-with-a-twist clothes and accessories suitable for work and play. On my next visit, I'll be on the lookout for this colour-blocked trench with oversize gold buttons, this faded and shrunken denim jacket, and this black-and-white textured tweed moto. (Can you tell I have a thing for jackets?) If you're on the hunt for Valentine's Day outfit ideas, LOFT also has you covered from the casual to the dressy. UPDATE: And the winner is @jojocake. Congrats, Joanne, and thanks to everyone who entered! Great giveaway! I've entered and am keeping my fingers crossed! ;) Thanks Lisa! Love the Loft, thanks for the chance! !